This publication summarizes the diverse pollutants and their sources that are harming the natural environment and people’s well-being in the Greater Mekong Subregion. 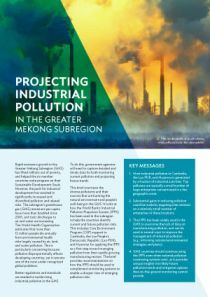 It looks at how the Industrial Pollution Projection System (IPPS) has been used in the subregion to help identify current and future pollution risks, and makes recommendations for its future application. This brief was produced by the Core Environment Program of the Greater Mekong Subregion, which supports Cambodia, the Lao People’s Democratic Republic, and Myanmar in applying the IPPS as a first step toward managing pollution from their rapidly growing manufacturing sectors.